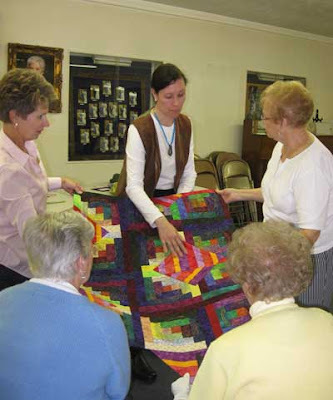 I was invited to speak at a local quilt exhibit this weekend. The exhibit was entitled, "Every Quilt has a Story" and my presentation was "The Visual Language of Quilting," accompanied by a trunk show of 20 of my quilts. The audience was a mix of sewers, quilters and newbies to the quilting world. They were enthusiastic and asked lots of great questions. I love these kinds of audiences! They make for a better and more interesting presentation, and I much prefer dialogue to monologue. 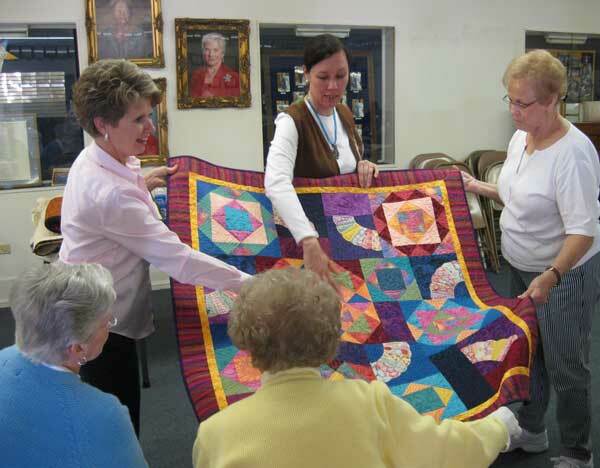 If every quilt tells a story, then quilting is definitely one of the main characters. There is something magical about the quilting stage of the process... the smooth, flat fabric takes on interesting textures, motifs pop out in a crisp bas relief, and patterns begin a dance across the quilt top. An amazing transformation occurs from two-dimensions to three-dimensions before our very eyes. 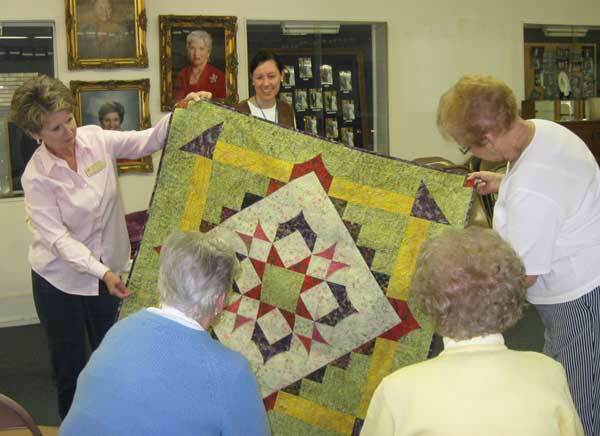 The audience was inspired by the combination of vintage Dresden plate quilt pieces and colorful, contemporary fabrics in "Dresden Meets Marti at Riverbend." Christmas Baskets—from her scrap basket and mine. 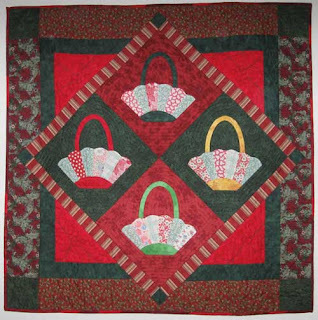 The Riverbend quilt and "Christmas Baskets—from her scrap basket and mine" (left) addressed the quandary of orphan quilt pieces, vintage finds and blocks from great aunt Millie's stash. I believe the original quilter of these Dresden plates would appreciate me continuing her story by finishing a quilt that included her blocks. Another important aspect of telling the quilt's story, is to document information on the label. 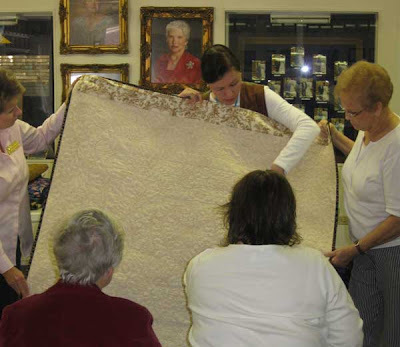 Make this part of the quiltmaking process! Extra quilt blocks, scraps or left-over binding strips can be used in creating and framing a label. Just do it! Label on the back of "Colours of the Sun"
A more traditional style quilt calls for classic feather motifs in the quilting. These feathers were quilted free-motion without marking. The pieced design on the quilt top determines the space for the quilted motifs. The light colored backing fabric shows off the quilting. Here is a traditional log cabin block made with bright colored cottons and batiks. Surface design using oil paint sticks added interest to this art quilt. 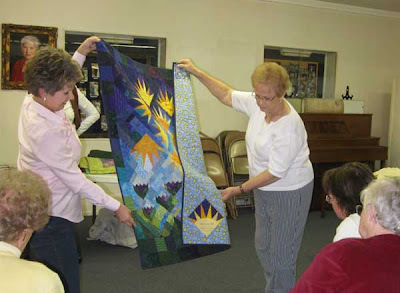 I designed this quilt (above) for a class I taught. Value, color and print should be thoughtfully considered in making fabric selections. 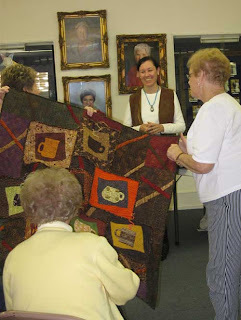 All these elements, including the quilting, work in concert to tell a story. 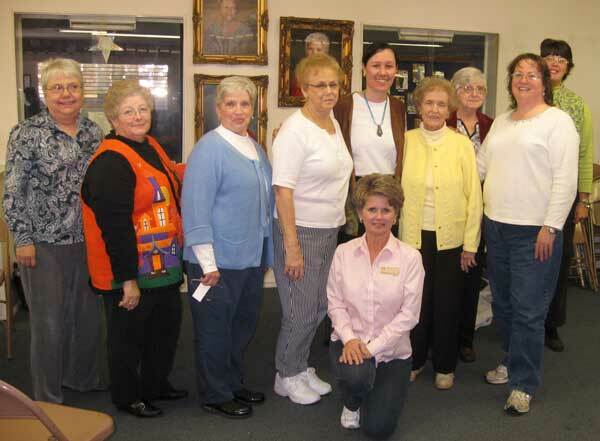 Thank you to the Eastern Stars for inviting me to their quilt exhibit. And a special "Thank You" to my good friend and quilting buddy, Sandy, for her gracious introduction, to Jewell for her assistance with the quilt display, and to Elizabeth for the great photos. 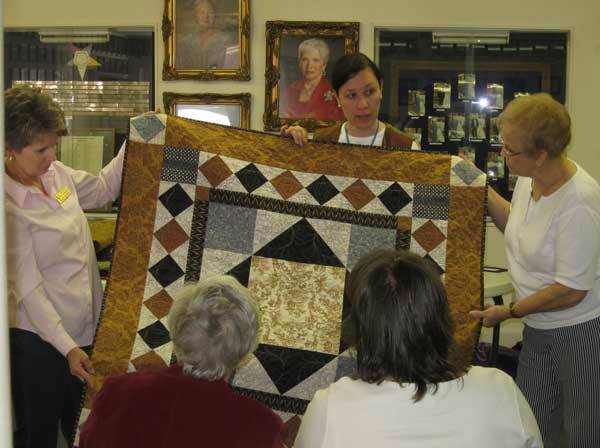 I can be contacted at veronicaquilts@gmail.com for quilting services, workshops and presentations. Thanks for all the great quilts. Your color selections are pure art.